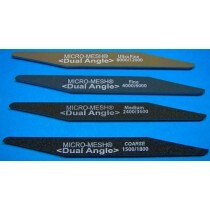 1/2" by 5 3/4" Micro-Mesh files that taper to a 15 degree angle at both ends. Each file is made up of 2 grades of Micro-Mesh, one finer, one coarser. 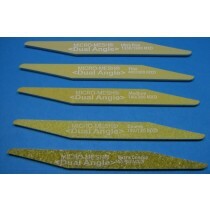 Perfect for deburring and for removing flash and surface imperfections in difficult to reach places. Files are workable and abrasive up to the very end of each file and can be rinsed and dried and stored for future use. 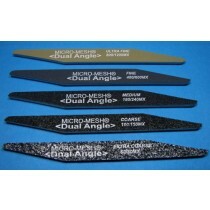 These files are available in Micro-Mesh Regular, Micro-Mesh MX and Micro-Mesh MXD (Diamond). Useful in a wide range of sanding applications. For softer surfaces such as plastic, wood and coated materials try Micro-Mesh Regular. For general metal finishing choose Micro-Mesh MX and for harder metal and ceramics try our Micro-Mesh MXD.